Q: What is the order (with scene descriptions) of all songs played in the movie? Q: What song is Landon listening to while mopping the floors? Q: What song is playing when Landon is driving to his father's house? I'm a 17 year old male teenager who happened to stumble upon this movie two years ago at school during a free day in math class (when I was 15). I liked it then, but the math class ended before the movie could be finished. Finally, on the WB a few days ago, the movie aired and I saw the conclusion. AWTR contains a heartfelt conclusion to a story where you get to care about Landon and Jamie, two polar opposite teenagers who face peer struggles and the perils of love and death. The situations that occur are very real, and very sad. Once the movie finishes, you'll be left wondering what happens to everyone (heck, even though it doesn't make sense, I want a sequel!). As a maturing male, I couldn't help but cry inside, and I'm someone who felt indifferent toward movies like Titanic. I found myself wishing I were either Landon or Jamie, because they represent the real virtues of life and love. Aside from the movie's undying message, there are some slight flaws. The ending could have been expanded a bit more (you'll see when you watch it as I don't want to spoil anything) to include more emotion. 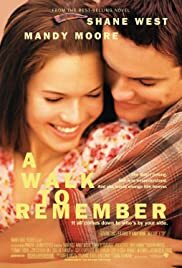 Otherwise, the acting done by Mandy Moore and Shane West is superb and top notch - these two actors have quite the career ahead of them. You'll see as these two characters develop that you can't imagine any other people doing the job. This isn't your typical love story, because when it comes down to it, the love is only part of the whole scheme. While I never expected this to touch me so much, AWTR enters as perhaps my favorite movie of all time. You will feel as if you're a part of the movie, you will be able to relate to them, and you will love it. AWTR succeeds in delivering a great experience. Available on DVD now, you'll be wishing the release had deleted scenes, et. all. Highly recommended. 368 of 415 people found this review helpful. Was this review helpful to you?